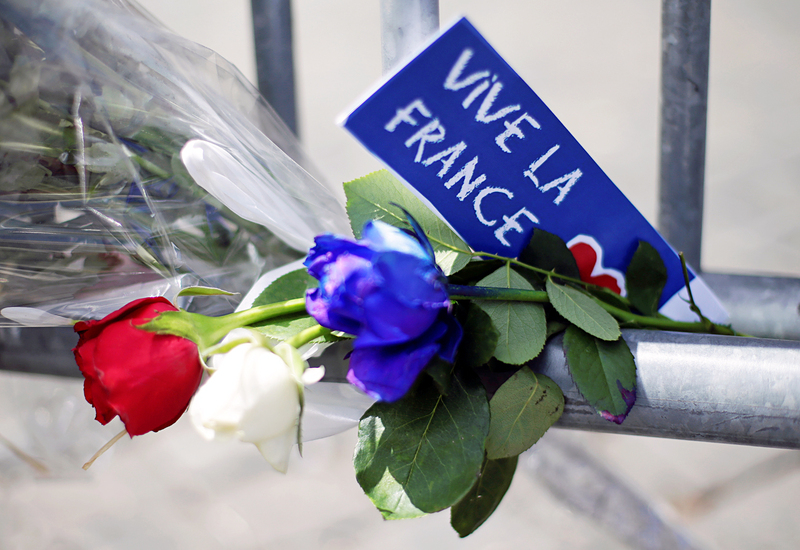 Flowers are seen attached to a fence to remember the victims of the Bastille Day truck attack in Nice in front of the French embassy in Rome, July 15, 2016. France has experienced yet another horrific terrorist attack. This time the murder weapon was a truck plowing over a crowd celebrating Bastille Day in Nice. There is double symbolism here: France's most important national holiday and the most fashionable resort, the embodiment of satiated relaxation. In March, after the explosions in Brussels, French President Francois Hollande said that the country is in a state of war. I thought back then that little really stood behind his resonant words. War is a radical change of behavior and a renunciation of habitual activities. The Europeans' reaction to the increasingly skillful attacks is exactly the opposite. They will not allow criminals to force them to renounce their values of openness and their way of life. The frequency of the acts and the obvious helplessness of the secret services shows that without re-evaluating the fundamental social order it will be impossible to break the horrible wave of terrorism. The "Israelization" of life, that is, the subjugation of society to the aims of guaranteeing security is becoming inevitable, but for this a conceptual justification of the change would be needed. In a certain sense for Israel it is easier since the history of the Jewish state is the history of wars with neighbors and therefore many generations of Israeli citizens were practically born with the understanding that security is the main priority. Contemporary Europe, on the other hand, grew and developed according to different principles. If viewed in the context of the events in Nice, the fanfare that NATO performed in its own honor several days ago during the summit in Warsaw is rather absurd. With titanic effort the alliance decided to protect the Baltic States and Poland from the Russian threat, sending four battalions to Eastern Europe on a rotating basis. The joy about the decisive action was somewhat surprising since members of the alliance are supposed to guarantee their own security without all the special ceremonial events. And after last night's tragedy NATO's decision resembles an attempt to look for missing keys not where they were lost but under a streetlamp. The most shocking fact for the Europeans is that the gravest threat is coming from within. Practically all the biggest terrorist acts of the 2000s and 2010s were carried out by citizens of the corresponding countries. The political consequences are obvious: The growth of the extreme right will continue. It is clear that fears related to terrorism and migration (in the mind of the average citizen it is one aggregation of dangers) have become one of the decisive reasons for the vote that no one had reasonably expected from the British referendum. A series of votes in key countries in the next year and a half will bring new surprises – the presidential elections in the U.S. in November and in France next spring, the parliamentary elections in the Netherlands and Germany in 2017 and in Italy in the beginning of 2018. In all these cases, excluding Germany, there is a chance that populist forces will not only strengthen but will actually come to power. Even if this does not happen, the political landscape is bound to shift towards the conservative right anyway. By the way, the next test will be the presidential elections in Austria in September. Nice cannot but influence the discussion about the EU's future, a discussion that began after the British referendum. It is also clear that the era of federalization and "open doors" is coming to an end. Talk about the need to re-establish sovereignty and the gradual return of rights and opportunities to national governments is becoming more and more accepted on a general level. In particular, the leading cabinet of ministers in Europe, that of Germany, with its head Angela Merkel, is leaning towards this solution. The impulse manifested itself on the day after the referendum by Germany's Social-Democrat Foreign Minister Frank Walter Steinmeier and his French counterpart Jean-Marc Ayrault to begin the process of intense integration in the name of saving the European project failed to receive any support. If the main idea is "security" then delegating prerogatives to abstract supranational leaders above will receive more and more opposition from the countries' citizens. In force majeure circumstances citizens want to understand who is responsible for their safety. The inability to protect citizens from the terrorist threat today is the same thing as the inability to defend freedom and your country's independence from a foreign occupier 200 years ago. The fight against terrorism is on the verge of ceasing to be something related to external circumstances. No matter what happens in the Middle East, even if the "Caliphate" is destroyed, this will have little influence on the behavior of radical Islamists in Europe, the U.S. and anywhere else. The war against terror is becoming particularly internal, at least this is the situation in the Old World. Civil war is never declared – it explodes on its own. And, it appears, it is already being fought. Fyodor Lukyanov is editor-in-chief of Russia in Global Affairs magazine and chairman of the Presidium of the Council on Foreign and Defense Policy.